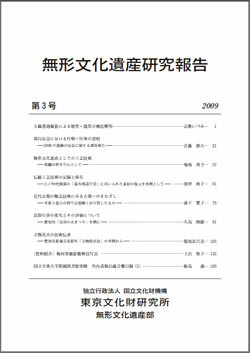 Accompanying the reorganization and change in name from the Geino Department to the Department of Intangible Cultural Heritage in 2006, the name of the report magazine was also changed from ‘Geino no Kagaku’ to ‘Research and Reports on Intangible Cultural Heritage’. This year volume 3 was issued. This volume examines intangible cultural heritage as a whole, not limited to Geino, and half of the included research papers and reports are not directly connected to “Geino”. As soon as preparations are finalized, the PDF edition of all contents will be posted on our Website in the same way as before.